Well, it has been a long time since we last updated the blog. No excuses other than we've been busy. We got our motor home ready for Wayne and Diane for Thanksgiving. We moved it over to Bruce and Michele's lot. Wayne and Dianne (Lee's Sister) arrived and enjoyed the use of the motor home for the few days they were here. 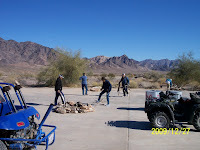 On Sunday (I think), they headed off to their rental in Yuma. We had received word from Bill and Sharon (owners of the lot that we had rented for December and January) that we could move the Motor Home over anytime. Before we had a chance to move the motor home from Bruce and Michele's lot, the twins (Two twin sisters here in the park) were walking by our lot and Susan overheard one say to the other "It's Gone!". Sue then spoke with them and they were relived that our MH was just over on another lot. Their sister is coming down in February and they were hoping to rent the motor home for her. So, we have it rented for a third month. When we had arrived here, I discovered that the Dune Buggy had no brakes. I filled the reservoir and we were good to go. However, after our first desert run, I noticed fluid spots on the patio. The reservoir was leaking. Off to the store and purchased a replacement. I installed the new reservoir and we were good to go again. Two trips into the desert later, the reservoir was cracked and leaking. Time to order a metal reservoir. I installed the new reservoir, but leaking continued. Now the Master Cylinder was leaking. More parts to order. Once the new Master Cylinder arrived, I got busy installing it and the metal reservoir. Now, I need help to bleed the brakes. I had one of the neighbours give me a hand. Good to go. Well, when we went to use the buggy the next time, NO BRAKES. Time to bleed them again. Time to use my mechanic's helper from my racing days. Sue sat in the car and ran the pedal while I crawled around on the ground opening brake bleed valves. Charles from across the street came and helped out by ensuring that the reservoir stayed full. Now, we are good to go, again, I hope. We have been busy with the Social Committee working Thanksgiving, steak nite, breakfast, Christmas diner. We had gone to the new Wal-Mart in Parker for groceries and found Turkeys for $0.40 per pound. We bought 7 18 - 20 pound birds. You know, dinner for 165 of our closest friends. We did a road trip to Palm Springs in late November because we wanted to pick up stuff (and you know how important stuff is) from Costco and Sam's Club. We even managed to head over to Salome to visit Bob and Joan for a day. 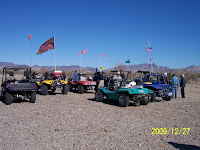 After Christmas, one of the residents arranged a buggy run with the owners in the park. We ended up with 11 units going out and heading to Midland. We even had a wiener roast for lunch. So, as you can read, we have been busy. We went to the New Year's dance, but we had been given the night off from the organizing side. Cool, we were able to leave the party before it was over. On the weekend, we were informed that our renters have purchased a trailer in Yuma and it is scheduled to arrive by the 7th. So, they are busy trying to find a lot to put the trailer on and be able to leave it here over the summer. Maybe my New Year's resolution should be to try and keep this Blog more up to date.